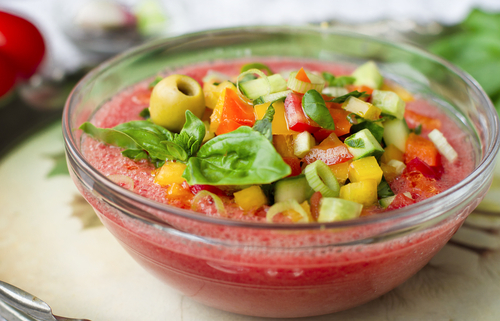 This Year’s Rendition: Summertime and the Living is Easy…It’s Gazpacho Time! Can you hear Ella sing it? This year I have decided to grow some of my own heirloom tomatoes in ample clay pots to augment the organic produce nearby. I am lucky to live near an amazing array of organic farms in Santa Cruz and Monterey County. They provide an auspicious assortment of summer fruits and vegetables. One such farm nestled in the rich-loam valley of the Soquel Creek protected by water and redwoods is Everett Family Farm. I feel assured that everything that I buy from them is truly organic because the farm is certified by CCOF. I drive by many a farm stand that claim to be organic but can’t be bothered to be certified by a USDA third party certifier. Well, I simply fly right by them and choose the good farmer who is. Many hot days have already aroused the summer. As the coastal fog burns off and the house heats up, there is no temperature allowance inside for a flame. So it is with cool intent that I unpack my Cuisinart, sharp knives and smooth wooden cutting board handed down from my German grandmother. I set about with a spicy gleam in my eye and a primal hunger for everything fresh, raw and juicy. The basic ingredients to any gazpacho are pretty simple. I pluck the first of the auburn cherry tomatoes and slice them into a background of diced beefsteak and organic vegetable juice. Elongated English cucumbers and blocky red bell peppers are chopped and hazarded into the smallest of bits. Even tinier morsels of sweet onion and rouge garlic cloves are dashed with a wager of Worcestershire, lemon and horseradish. After you gently wash and assemble the ingredients, it’s all about how finely you cut, chop or blend them. Texture and seasoning are the basic wild cards. One must set the entire concoction to chill for a few hours because the longer gazpacho sits, the more its flavors intermingle into maturity. Once I set forth with the basic recipe, I often get a little racy and start experimenting. For one variation, I add cayenne, lime, cumin and oregano. Basil, cilantro, chives or parsley also serve as good herbal companions. Then throwing caution to the wind, I shake in a little Sriracha sauce, black olives and avocado, oh my! Each variation is a reflection of my mood: do I feel calm and smooth with every ingredient finely blended and awash with red wine balsamic, or do I feel daring and spicy, sporting up jalapeños and mangoes? The deviations are endless and absolutely delicious! Since tomatoes are the essential foreground of any respectable gazpacho, it’s important to always choose USDA certified organic. I believe they taste better being grown on soil that is full of living microbes and nutrients. And they just may be healthier. According to a 2012 study conducted at the University of Barcelona, organic tomatoes contain higher levels of antioxidants. Additional research from the University of Newcastle in the United Kingdom suggests that organic food has more antioxidants, fewer pesticide residues, and less toxic heavy metal contaminants. In addition to the health benefits, I like rewarding those who are stewards of the earth and farm organically. You can happily Google your way to an endless display of gazpacho recipes. Experiment and tell me about your favorite summertime gazpacho fling. One of these mornings, you’re going to rise up singing. Then you’ll spread your knives and go to the farm. Organic tomatoes with juicy cucumbers can’t harm you. 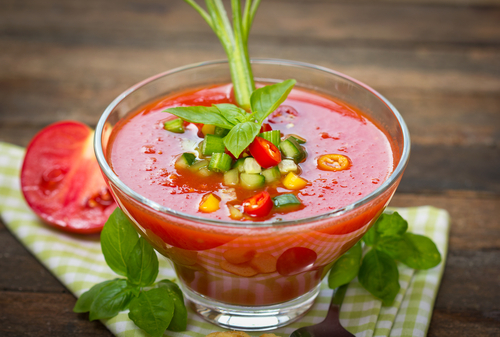 Enjoy fresh gazpacho with friends and family standing by. This entry was posted in Culinary Delights, Social Implications in Agriculture, What is Organic and tagged Organic Agriculture, Organic farming, Organic food. Bookmark the permalink. One of these mornings, you’re going to rise up singing. Then you’ll spread your knives and go to the farm. Organic tomatoes with juicy cucumbers can’t harm you. I thought our ‘Cool Jazz’ Vocalist from Taos, ELLEN LIVESAY, could have a little FUN with it, so I wrote Ellen this note: Would it be possible for you to do a quick, FUN little recording as a surprise for Melody, nothing tech, maybe just on a cell phone or quick Mp3, of a couple of verses of Ella’s Summertime, but using Melody’s lyrics as best you can and working in Organic a few more times? Let me know if you can come up with something.